Science Snaps are a 6th Grade Science Texas TEKS aligned resource to improve and promote scientific thinking skills and scientific vocabulary. Help your students identify real world applications of the academic vocabulary they are learning in class! 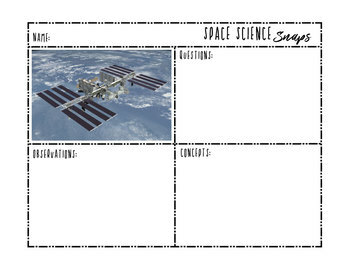 Science Snaps can be used for a warm-up, exit ticket, independent activity, class discussion, or even a short station activity. The high resolution source files for each photograph are included, as well as a blank template to create your own! The great thing about this resource is there are no “right and wrong” answers. However it WILL provide you with valuable insight into each student’s personal understanding of the topic, no differentiation required. Example is included for reference. +3 Bonus Space Science Snaps! - Also includes the high resolution photographs, teacher instructions and a blank template. All photographs used are public domain. 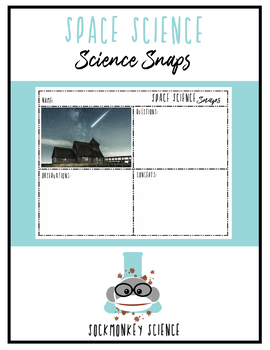 Save $$$ and purchase the Earth + Space Science Snaps BUNDLE. Please visit my store for more 6th Grade Science TEKS aligned resources, like my Vocabulary Bundles! You may also like my Science + Art Resources! Copyright © Sockmonkey Science. All rights reserved by author. This product is to be used by the original purchaser only. Copying for more than one teacher, classroom, department, school, or school system is prohibited. This product may not be distributed outside the school setting. Failure to comply is a copyright infringement and a violation of the Digital Millennium Copyright Act (DMCA). Clipart, content and design elements found in this PDF cannot be extracted and used outside of this file without permission or license. Intended for classroom and personal use ONLY.